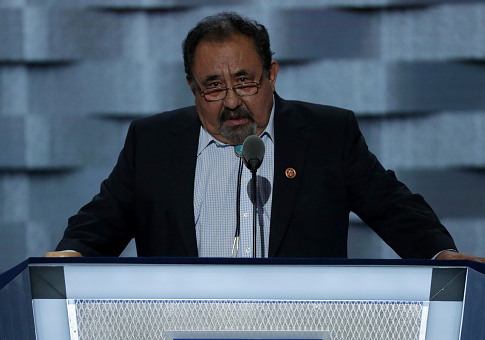 Democratic Rep. Raul Grijalva (Ariz.) arranged a "severance package" in 2015 to silence a former top staffer who threatened a lawsuit after claiming the congressman was often drunk and created a hostile work environment, according to a new report. The report provides insight into ways elected officials are able to "sweep accusations under the rug" with taxpayer-funded payouts, according to Washington Times. In the case of Grijalva's settlement case, the House Employment Counsel, which provides attorneys for all House offices, negotiated for taxpayer money to fund a $48,395 settlement to the female aide. The settlement summated to five additional month's salary when she left her job after only three months. The arrangement came to light just days after watchdogs were already demanding answers from the Office of Compliance, an office reported by BuzzFeed to have made payouts to settle sexual harassment complaints. Grijalva has denied any coordination with the Office of Compliance, and said no allegations of sexual harassment were made. "On the advice of House Employment Counsel, I provided a severance package to a former employee who resigned," Grijalva told the Times in an email. "The severance did not involve the Office of Compliance and at no time was any allegation of sexual harassment made, and no sexual harassment occurred." Grijalva did not provide an answer for why he agreed to an over $48,000 severance package for an employee who only spent three months on the job. Congress does not have a human resources department, so instead, the Office of Compliance handles sexual harassment and other workplace grievances. The settlements are kept secret and the complaint process can drag out for months while requirements are met, including mandatory counseling for victims, the Times noted. "Sexual harassment settlements are sometimes disguised as other transactions, like severance payments," said Peter Flaherty, president of the watchdog organization National Legal and Policy Center. "These settlements were made with public funds. Since we taxpayers were parties to these agreements, we have the right to know who on whose behalf we settled." Republican Rep. Brian Fitzpatrick (Pa.) called for the House Ethics Committee to investigate all instances of taxpayers dollars being used to settle Congressional harassment claims. "As if Americans needed another example of politicians playing by a different set of rules, this is an affront to the hardworking taxpayers forced to foot the bill for these heinous actions," Fitzpatrick said. This entry was posted in Politics and tagged House Democrats, House of Representatives, Raul Grijalva. Bookmark the permalink.